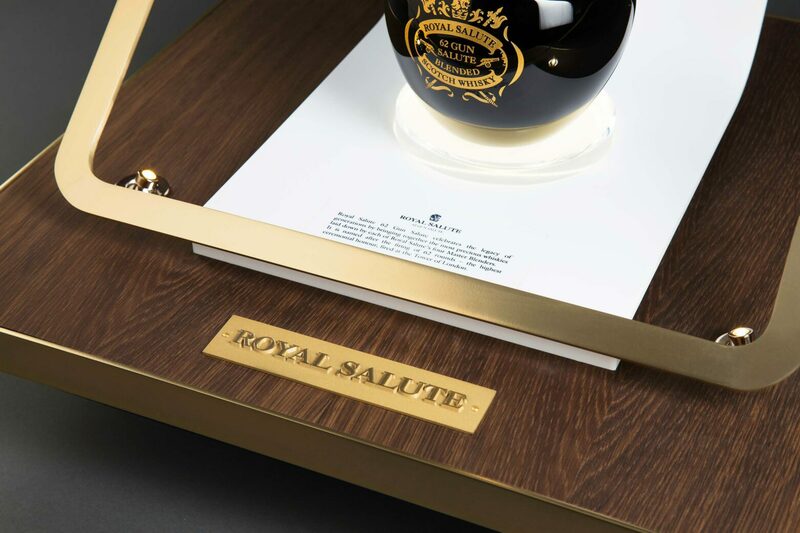 Royal Salute is the noble blended whiskey made by Chivas. To present these high-quality prod­ucts, Labvert designed an exclusive world for the customer to experience and purchase this sublime brand. 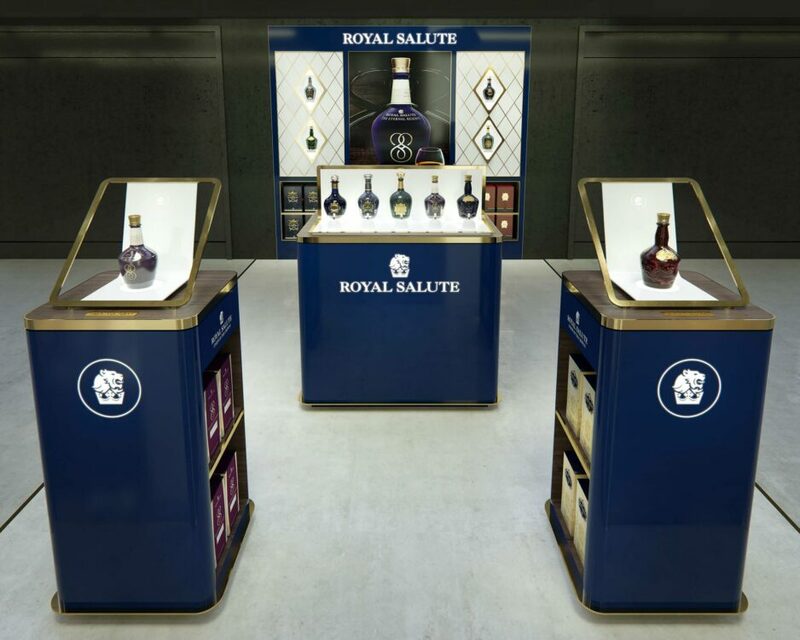 The famous ceramic bottles, the details of which tell of the tra­di­tional ties with the British royal family, are deliberately juxta­posed against an architecture of pared-back materials and shapes. Labvert successfully created a modern inter­pretation of a brand rich in history and tradition. 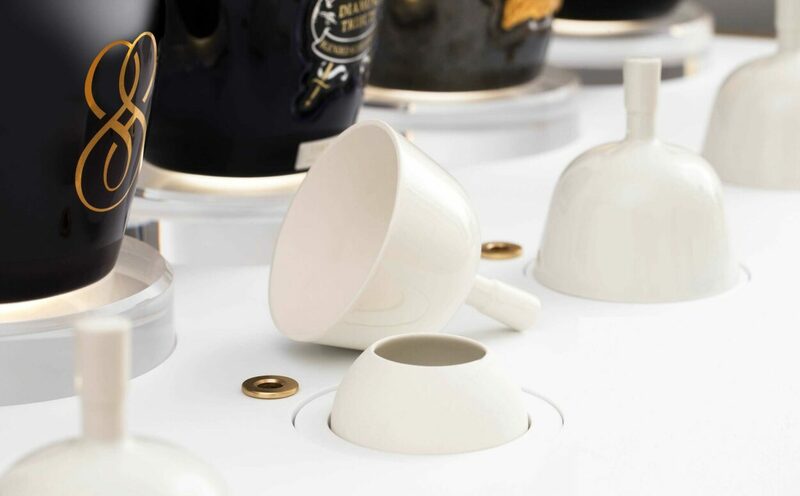 To allow customers to experi­ence the exquisite aroma of the whiskey, ceramic bells were specially designed as shapely objects to capture the valuable fragrance. The Rimowa Flagship Store in Tokyo’s vibrant shopping district Ginza combines high-quality Western design with the rich cultural traditions of Japan. Inspired by Japanese rock gardens, especially the famous Zen garden Ryoan-ji, sweeping, dynamic lines run through the store, inviting the customer to embark on a sensual journey of discovery. Along the way, customers encounter the baskets – woven room dividers made of filigree oak wood slats and handmade Japanese paper (washi) that connect the two floors vertically. The overall impression of the shop is inviting and minimalistic. Subtle contrasts between flowing and angular, as well as selected materials, such as warm wood and cool metal, create a calm background for the focused presentation of the legendary Rimowa suitcases. Dior has opened a glasses boutique not far from its headquarters in Avenue Montaigne in early 2018. The brand’s latest collection of sunglasses and spectacles will be presented here for the first time in its own boutique. Architecture and design studio Labvert was commissioned to design the new store, a continuation of its long-standing cooperation with Dior. The central inspiration for the design of the shop was the motif of the sun. A golden sun installed in the window shines toward the outside, inviting passersby into the bright interior of the posh boutique, where illuminated glass lamellae along the walls create an impression of beams of light and their reflections. The round central table also picks up the sun motif while serving as presentation area for the newest sunglass collections, which are lit by chandeliers equipped with optical lenses hanging overhead. The hand mirrors and stools as well as the carpet are likewise Labvert creations designed and crafted specifically for the Dior shop. The overall style of the boutique incorporates typical Dior brand codes alongside their modern interpretations. Contrasts of reflecting glass surfaces with open-pored wood and soft fabrics create an inviting and varied atmosphere. For the new Limited Edition of Hennessy X.O by Marc Newson, Labvert created a unique concept for retail spaces and presentation. The challenge was to rethink traditional retail space and offer a new physical and emotional brand experience. Driven by the trend of technology supporting content, Labvert created a special spot - the X.O Capsule. It offers a 360° journey through an immersive video. The creative use of reflections allows people to see themselves in the space and thereby become part of it. Sharing this experience with others creates the adventure of being part of something special. Light lines running through the space are the interpretation of the modern decanter design marked by a corrugated relief. Designed to emphasize the iconic image of the product, Labvert develops a universe to tell the consumer more about the X.O blend and Hennessy. The location of this Villa is in the 19th district of Vienna, a renowned wine growing area and famous for its prestigious villas, reminiscent of the Vienna of old times. Respecting the rich architectual heritage of the district and famous predecessors such as Josef Hoffmann who built very close by, Labvert created the contemporary interpretation of an elegant family home. Neatly seperated volumes and different materials give a clear vertical structure to the building. The top floor built mainly of glass provides the villa with a light and airy atmosphere. The Rimowa Pop-up on Rodeo Drive in Los Angeles shines a new light on the legendary German suitcase brand. The focus is not on presenting the entire product range, but rather capturing and visualizing the dynamic moment of travel, the experience of mobility and movement. In the bright, modern room, the design from the Labvert architecture studio lets individual suitcases visually glide through the room on conveyor belts or take to the skies overhead in a carousel. The inviting lounge area overlooking Wilshire Boulevard invites you to rest in the comfortable armchairs and take in the sights which include more than just suitcases. Books, magazines, cosmetics and accessories related to travel are all presented on their own lifestyle shelves. In the heart of Saint Tropez, Labvert is designing the interior of an apartment with a direct view of the marina. The elements of the interior are subtly influenced by the flair of the Côte d’Azur. Colours, materials and details—all inspired by traditional Mediterranean styles. To develop an object to test per­fumes and to give form to Dior’s ‘savoir-vivre’ — this was the design challenge of this project. In order to test perfumes, they are usually sprayed on paper strips. This way, however, the scent gets on the hand too, thus the tested smells mingle and the perfumes become indistinguishable. To meet this challenge, Labvert developed a funnel-shaped object made out of glass. Inside is a ceramic cylinder that carries the fragrance. Shielded from the glass cone, the perfume can unfold. The fragrance tester is as pre­cious as a gem and repre­sents the fine workmanship, sophistication and avantgarde approach associ­ated with all of Dior’s products. The design of the necklace Beach Balls is a miniature-scale version of an architectural project of the architect and designer Stephan Vary. The poetic trans­lation of a room concept into a miniature object is a masterful interplay of shape and dimension. Made by the renowned Viennese jeweler Schullin, the jewelry piece represents extravagance and distinctive sensibility. The two spheres can be arranged in different constella­tions. In the light, the lattice structure of the pendant throws delicate shadow patterns on the skin and clothing. This interplay of light and shadow was captured in an exclusive shoot in Villa Beer in Vienna by the inter­nationally renowned fashion photographer Michael Dürr. Labvert designed this new one-of-a-kind concept boutique landmark for Parfums Christian Dior. Their first boutique focused on makeup. It is housed in a striking building, the Oculus of the World Trade Center in lower Manhattan. The 650-square-foot shop was designed to exude an ambiance of backstage at a fashion show with a large floor-to-ceiling video screen, flashy photographs and six work stations where a staff of six makeup artists offer customers professional services. The clients have a chance to experience a wide range of new digital innovations. Labvert created a curved bar table for the beer brewery R.M.Müller Bier which alludes to the nuanced colors of the brews. Five specially developed clay coolers are embedded in its center. The design of the expansive storage installation was influ­enced by the bottle fermentation method, which requires the bottles to remain vertical: In place of ordinary shelves, a geometrical arrange­ment of oak slats forms the support for the five beer varie­ties. The beer glasses were also specially designed by Labvert. The X-Chairs series includes a range of chairs that have been designed exclusively for Dior Beauty Boutiques. The design is inspired by classic director’s chairs like those used in the back­stage area of major fashion shows. The different models, from low to height adjustable, offer a modern solution for the tempo­rary act of sitting. The chairs stand out with their extremely precise manufacturing and luxurious details including embroidered logos and handbag hooks. The X-Chairs series is manu­factured by the traditional Viennese company Wittmann. The building type of the depart­ment store has a long tradition. As early as the late 19th century, technical innovations made it possible to replace the closed facade with large glass surfaces, thus opening it up to the outside. A transformation of this curtain wall and the opening of the build­ing play a special role in this project: the stern quadratic grid of the facade is dissolved by tilting the eight large windows in differ­ent angles and directions. The reflections of the surrounding historic city center are mirrored in the large windows. The Château de la Colle Noire in Montauroux is the former residence of Christian Dior. The area around the nearby town of Grasse inspired the doyen of fashion to his world famous perfumes. Labvert was commis­sioned to design a perfume museum for the Château de la Colle Noire to present the Dior perfume creations in all their diversity; from the first scents that still bear Christian Dior’s signa­ture, to the latest perfumes by François Demachy. 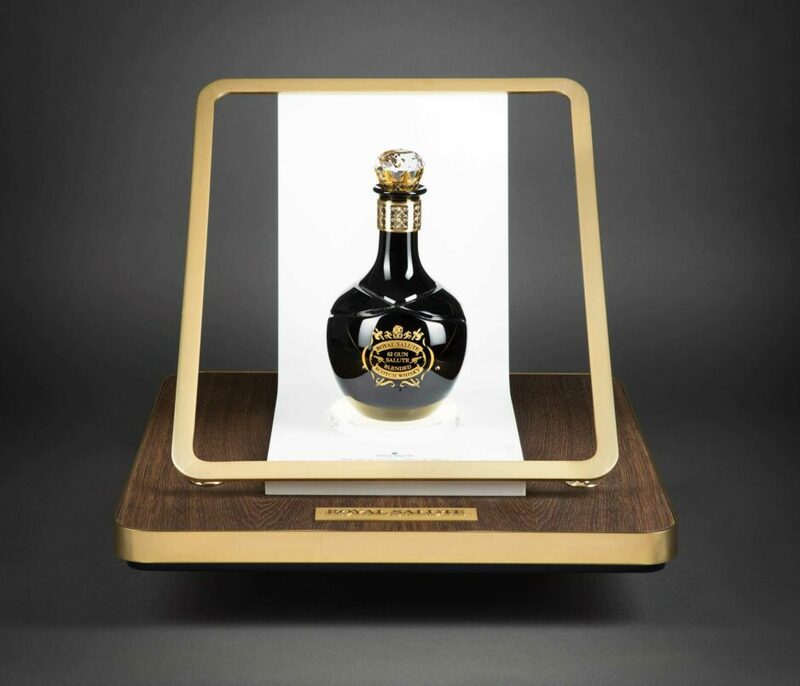 The noble vintage flacons and selected new fragrances are presented atmospherically in sophisticated showcases. Original sketches document the creation of the first ideas of Dior. In Château de la Colle Noire, the contrast of the epochs is impressively pre­sented with the atmosphere of a bygone era existing in harmony with modern design. 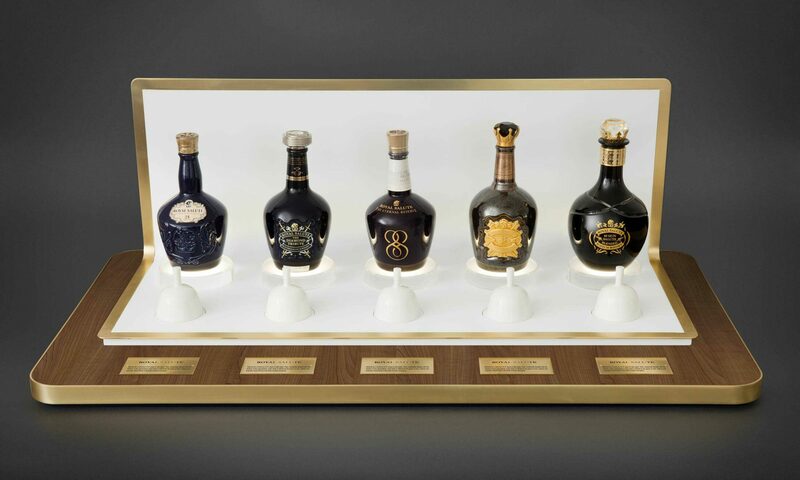 Cognac is a complex blend of distillates of different vintages. This art of blending is the visual theme that Labvert captures in the retail architecture for the distin­­guished cognac brand Hennessy. The characteristic copper, gold and brown tones of cognac result­ing from the aging in oak barrels flow into each other and create a strong background for the glass bottles. Depending on the position of the viewer, a different cognac tone is high­lighted. Integrated elements like the education wall, hot spots and tasting tables among others, illustrate the rich history of the company and its products. With the Aroma Kit, Labvert has developed a visual object to pres­ent the complexity of the manu­­facturing process for whiskey as an experience for the senses. The aim is to tell the story of the exclusive mixture (‘blend’) in several chapters, each associated with an aroma nuance. For the experience, the Vienna perfumer Wolfgang Lederhaas created the exclusive fragrances ‘pear’, ‘melon’, ‘vanilla’ and ‘smoke’. For the exclusive Swiss cosmetic brand La Prairie, Labvert devel­oped the concept for a retail design that reflects the high quality and perfection of their anti-­aging products. The simple clarity of the architecture em­phasizes the high scientific standards and precision for which La Prairie is well-known for. With the upsurge in multi-channel retailing in mind, Labvert investigated a concept in which the store becomes a testing venue, product playground and experiential brand hub. It is a place where a customer can ex­peri­ence the brand and products with all senses and gets a personal consul­tation from a trained beauty expert. The ritual of ‘The Art of Beauty’. Adolf Loos designed a light for the men’s fashion store Knize in Vienna in 1930 which today serves as the inspiration for new designs from Labvert. The dodec­ahedron is interpreted based on a contemporary under­standing of shape and today’s technology to form a chandelier or light object. The basic shape is implemented in various materials and light media and manufac­tured in limited series. The project Loos Lamps is a dialogue between generations. 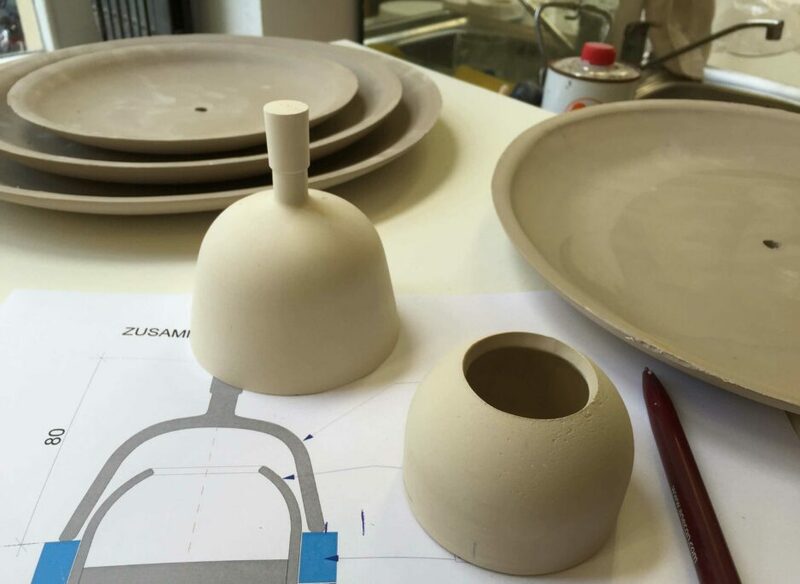 Sculptural quality and new tech­nologies are seen as a con­tinua­tion of a Viennese design tradition in a contemporary context. Labvert created a luxurious loft in the center of Berlin. The two-story penthouse is well-lit and spacious, and extends over more than 460 sqm in a building designed by famed London architect David Chipperfield. Exclusive interior design and the harmonious interplay between selected vintage elements and fresh design ideas create a pres­tigious atmosphere. The Umdasch Shopfitting Group, an internationally active corporation and a leader in the field of shop and retail design, assigned Labvert with the conception and realization of their trade fair representation at Euroshop 2014 in Düsseldorf. Italian piazzas inspired the Labvert design for the 1,000 sqm exhibition stand following the theme ‘space for people’. White, slightly conical shapes cover the three exhibition areas. Their inter­section opens towards the Piazza, which included a 16 m long bar and a restaurant for 120 people. Labvert’s new design for the pedestrian overpass from Millennium Tower to the Danube river transforms the passageway into a living bridge. Shops and restaurants make the walk to the Danube more attractive, and the bridge leads directly to a newly designed beach area. The overlapping circles forming the footprint of the Millennium Tower itself become spheres in Labvert’s design and provide an imposing roof to make this new recreation area in Vienna’s 20th district visible from afar. The Austrian textile company Palmers Textil AG wished to develop a shop especially for a young, fashion and price con­scious target group based on ‘Paradise’, the trendiest of their four lingerie collections. The result of the cooperation between Labvert and the graphic and advertising agency dasuno is an illustrative landscape full of details, complete with lounging fauna and blossoming flora. The visual world forms the conceptual brackets of the design, fills the brand name with contents and lends the shop its identity. The start was marked by the opening of the 120 sqm Paradise flagship store at magnificent Rote­nturmstraße in Vienna. Labvert designed the entire ground floor of the renowned family-owned haberdashery Sir Anthony as one large window display. The new shop design is spacious and brightly lit, the merchandise is well-visible from the street, and the Sir Anthony brand is placed at the center of attention. The increased openness of the design draws customers more strongly into the store and invites them to browse. A lit staircase leads to the sec­ond floor, furnished like a parlor with cupboards, tables, and couches and inviting customers to linger with its comfortable atmos­phere. The focus on black-and-white contrasts conveys a sense of modest elegance and timeless modernity. This duplex is located on a lake south of Vienna. The client asked for a house that will mainly serve as a vacation residence in the summer. The design is marked by a wooden deck as a foundation and the roof enclosed by glass surfaces that allow direct access to the outside areas and a view of the lake. Separated by large sliding doors, a covered and shaded ter­race flows into a spacious open living, cooking and eating area. A long shallow stairway leads to the upper floor with three bedrooms and two bathrooms. These are arranged on multiple levels. The master bedroom floats above the meadow and the two other bedrooms extend through the roof. The arrangement of the volumes lend the roof a wave-like form. The bathroom offers a captivating view of the sky and the clouds passing by. At the center of the design considerations was the search for an ideal-typical form for the ritual use of the bottle: to provide water at the table. The oldest and best known vessel for this purpose, the classic water carafe, served as a model. The design of the new glass bottle for Römerquelle adopts the shape of a carafe and optimizes the form under close considera­tion of the production conditions, aesthetic conception and ergo­nomic parameters. The larger bottle opening allows the water to pour gently into the glass without resistance. The logo color, the darker ‘bottle-green’ for which Römer­quelle is known for, was lightened to better present the crystal-clear contents and give a fresh and hygienic appearance. The smooth glass surface emphasizes the purist design. When designing the new YO PET syrup bottle, particular attention was paid to the feel and ergonomics of the bottle. The elegant, conically shaped bottle widens at the top to form a ‘syrup pool’, is easy to hold, non-slip and allows for precise pouring. The cap is especially designed to keep it from getting sticky like conventional screw caps. For Latella, the Austrian classic fruit whey drink in a small tetra carton, Labvert developed a contemporary re-design, for both the traditional label as well as the labels for the PET bottles and ‘Lattella g’spritzt’. All around the world, Labvert designs and realizes boutiques as well as shops representing the prestigious Giorgio Armani Cos­met­ic brand. Particular attention is paid to the continuous further devel­opment of the shop architecture as well as to the staging of the product presentation in the prod­uct categories of perfume, make­up and personal care items. Currently, the main focus of the partnership is on the visualization of new company projects.